As a horse owner, you MUST take care of lots of things. Among, choosing the best horse fencing is extremely important. It’s because you need it to protect not only your beloved horses but also your property and pastures. But not all the products will be suitable for your situation. That’s why you need to follow us to get the necessary information in order to make the right decision. How to choose the Best Horse Fence? Q1: Can I build the fence by myself? Q2: How tall should the fence be? Q3: What kind of horses to contain? Q4: Does aesthetics matter? Should I invest it? Q5: How long should I spend on maintenance? Time To Make Your Final Choice! With 1000-feet white spool, the ElectroBraid PBRC1000W2-EB is suitable for large farms. Not only does it offer your horses lots of space to wander around but also keep them secure inside. Since this product is sturdy, robust, and durable, the horses cannot cut the wires to break free. Besides, you don’t have to worry about its strength. This horse fence satisfies the quality standard of things like seatbelts and parachutes. That means it is stable and can withstand a lot. The ElectroBraid horse fence has copper included in it. Since copper is famous for the best conductor used in wiring, this fence conducts electricity well. Another best electric fence to protect your equines is Premier PoultryNet from Premier 1 Supplies. It’s a 48-inch electric polywire fence. With only 35 ohms of resistance per 1000 feet, this product is a good conductor and doesn’t waste much power while using. Also, it comes with double spiked spots for extra stability. Your horses will be always safe inside the fence, and it’s secure enough when using for moist or soft soil. Of course, you won’t meet any difficulty to install it. Just spend only 15 minutes to establish and then it will last longer. But you should notice the vegetation development surrounding the fence because the weed growth can enhance the power dissipation from the fence and lessen its effectiveness. Fits for not only horses but also poultry, goat, sheep, etc. 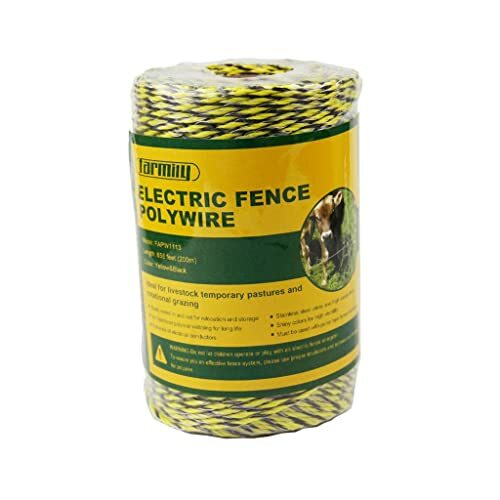 If you are looking for a simple solution to confine your equines, Farmily Portable Electric Fence Polywire is what you need. Although this fence is cheaper than the two products above, it’s famous for a robust and highly visible rope. Moreover, it’s UV stabilized polymer for long life. This product has a shiny color of yellow and black for high visibility. In case the color doesn’t stop the horses, the stainless-steel electric conductors will DO it. Since the Farmily fence is portable, it’s a great option for temporary fencing. And if you need to set up some emergency fencing quickly, that works well. Another excellent choice for visibility purposes is Gallagher G620300. 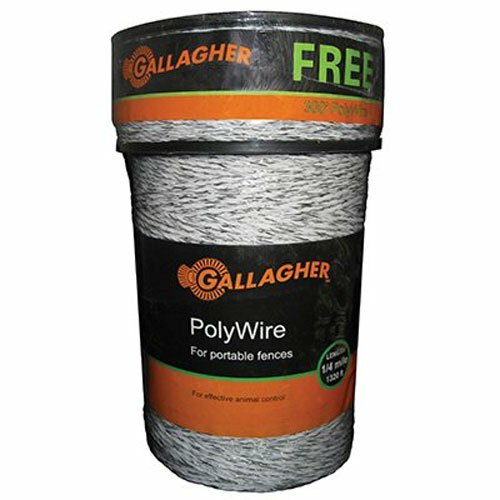 This electric polywire fence includes 6 stainless-steel wires, allowing them to conduct electricity well and keep your horses safe inside. 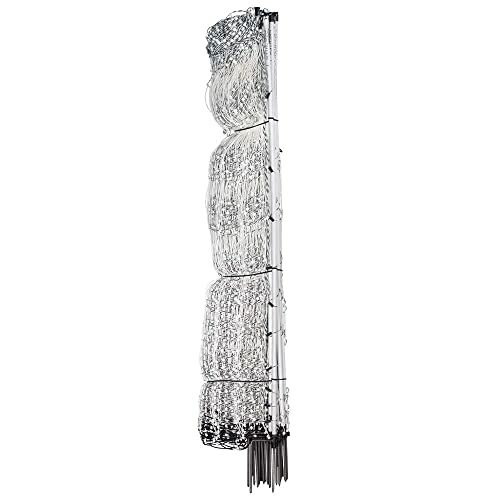 Since the wires are UV stabilized, you don’t need to worry about its lifespan. With an ultra-white color, it’s easy to see these fences from afar. In case you decide to buy this product, you will get a combo roll with 1312-feet and 328’ free to use. Of course, it won’t take a lot of space because you can carry it by rolling up with ease. The last horse fence that is known as one of the longest lasting ones is YARDGARD 308361B. It’s because this product is galvanized and covered by zinc. While galvanized material is durable and long lasting, the zinc-coated wires help to resist the increase of rust and lengthen the lifespan of the fence. Depending on your demands, you can select different sizes from small to large to confine your horses. Since the YARDGARD 308361B is manufactured in China, its price is reasonable. So, if you have a tight budget, you can consider it. With the top 5 fences above, you can easily find the one that suits your needs. But don’t miss some considerations below before buying one. There are some popular kinds of fences that can be used for horses. Since each comes with different pros and cons, you need to take into account to find a suitable one. Before going into details, make sure not to use barbed wire fences for your equines because they can make your horse injured if they get tangled. Now, let’s discuss the importance of each type! An electrified fence is good for the horses that like to lean, chew, etc. Since it only delivers a mild shock, they learn not to lean or run into the barrier. It can be availed by itself or in combination with other kinds of fencing to provide different current levels. When using this kind of fence, you should read more about electric fence charger. But not all areas allow using this fence, so please check with your local municipality before installing. A mesh fence is more durable and visible than a simple strung wire one. It should be spaced adequately (3 inches square) between wires to prevent the equines from getting tangled or stuck. You can consider the diamond-shaped or rectangular mesh because both are effective. A wire fence without the electrical current is quite easy to set up and one of the most inexpensive fences. However, it comes with a high risk of horses getting tangled in the wire, resulting in severe damages. It’s also not as visible as other kinds and often requires regular tightening because impacts and other interruptions loosen it. This traditional and beautiful fence is one of the most favorite choices since it’s easy to establish, highly visible, and less inexpensive, initially. However, they DO require more maintenance as the wood can be eaten by horses or warps, shrinks or cracks. Hence, that repair cost can increase more, and the general lifespan of this type is shorter than the others. A vinyl fencing looks like the wood rails, but it’s low maintenance and comes with a longer lifespan. As a highly visible fence, it DOES work for lots of horses. It’s also more expensive; however, and can break under too much pressure. Lots of horse owners combine the vinyl fencing and an electric fence for a useful and aesthetically pleasing product. 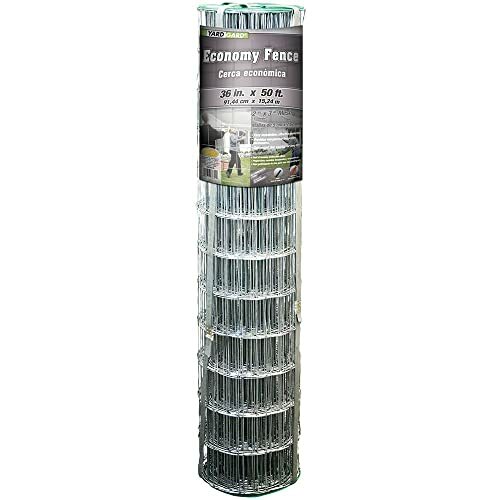 A pipe fence is popular in some places where the pipe is inexpensive and easily accessible. It’s also sturdy, visible, and low maintenance. 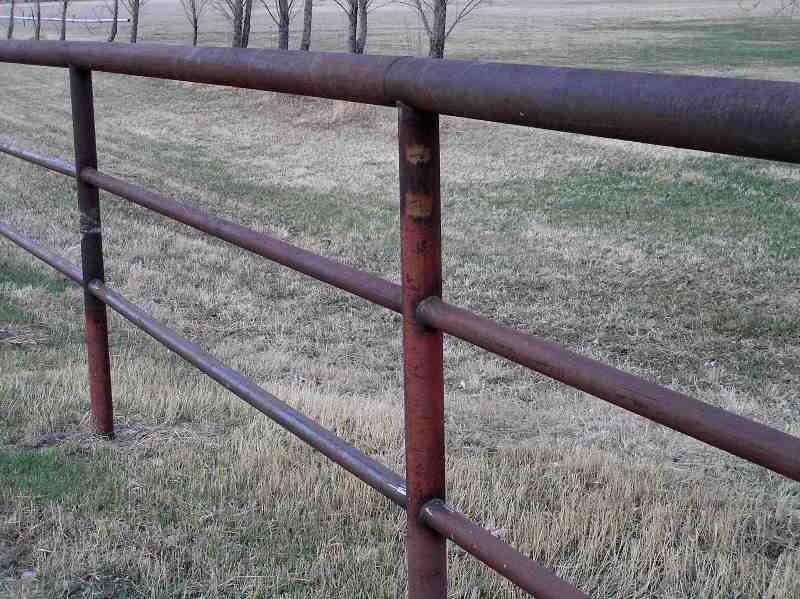 But be careful because this type of fence has sharp edges and unyielding strength that can make your horses injured. Additionally, it cannot stand up to muddy and wet conditions. No matter what kind of fencing you’re considering, you also decide the right height for the fence and the width of the gates. The height often varies with the types of horse to be held. For instance, miniature horses need a lower fence height. Meanwhile, warmbloods need a sturdier and taller fence. The gate needs to be a minimum of 4 feet wide. However, if you will be driving any vehicles through the gate like a trailer, truck, mower, etc., you should accommodate the width for them carefully. 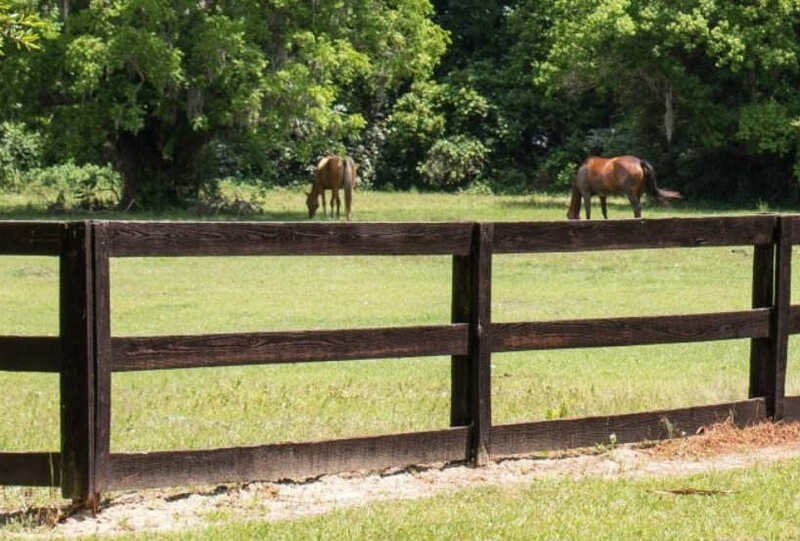 A good horse fencing must be highly visible to set clear boundaries and get respect from the horses. In case you’re using a fence that mixes with the environment or a low visibility wire, please tie colorful flags to the fence. Then walk your horses surrounding a couple of times so that they recognize the boundaries. All horse owners want a strong horse fence that can stand the time and continue to be safe. When it comes to the durability, make sure you check your local terrain and weather carefully. It’s because some fences operate well in all climates while the others only work in moderate temperatures. How much you spend is definitely one of the most important factors when buying fencing. It’s best to estimate your budget first and have a set amount that you are ready to pay. Make sure you evaluate your “must-haves” and “can do later” carefully in case your budget is limited. Aside from the first investment, please consult maintenance expenses. If the care of a specific type of fence costs too much, you might spend a considerable sum of money later. Of course, YES as long as you follow the directions of your chosen product. As a newbie, it might take you more time to complete. But if you have some practical experience, everything will be easy. Or you can consider hiring a pro installer to set or drive the posts and then leave you to finish the rail. As mentioned above, the fence needs to be high enough to keep your horses. The ideal height is often between 48 and 60 inches. Usually, the physical strength of the fence should be much less for your equines. However, if your horses are young and active and they tend to test the boundaries, the fence must be stronger. Or it needs to be electrified to stop escape attempts. In case you have miniature horses or foals, it’s best to add woven wire fencing with small openings to capture little hooves. The fencing should be low enough to the ground so that the small equines cannot reach under it or get their heads caught. As long as you can afford a beautiful fence, it’s okay to choose a more expensive product. There are also some situations that the expense of a good-looking fence is a MUST. For instance, if you own a training facility and want to draw high-end customers, your fences have to be nice. An electrified fence needs to be checked regularly to ensure the current isn’t shorting out. Meanwhile, a well-built metal fence lasts for years with little maintenance. In case you prefer the wood rail fences, make sure you check the nails and boards carefully. And if they’re painted, you have to repaint every few years. By going through our list, you now can decide which one is the best horse fencing for your equines, right? The good product must be the one that can keep your horses safe inside. Of course, it’s long-lasting and durable. 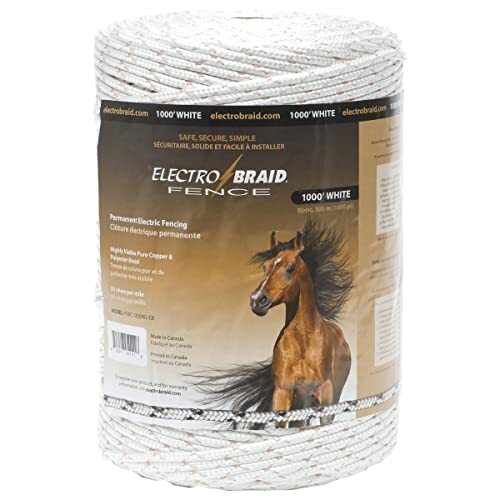 In this case, we recommend the ElectroBraid PBRC1000W2-EB Horse Fence. As one of the best electric horse fences, it can conduct electricity well to prevent the horses from escaping. Since it’s high quality tested, you’re guaranteed to get an excellent product. If you agree with us, give it a try by ORDERING it now. Or you can send us any query to know more about this topic. We’re always willing to help.